Rare migrant. 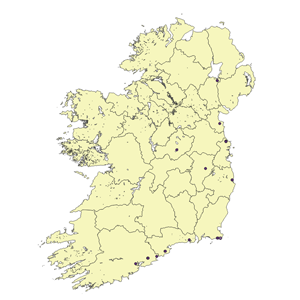 There is one report of this species in Ireland from Co. Cork in July 2000. It is widespread in southern Europe and a rare migrant to southern Britain. It was first reported in Britain as recently as 1996. In Europe adult males occur around ponds and are territorial although they are often "seen off" by larger Emperor males (Anax imperator). The lack of black markings on the thorax should distinguish this species from other hawker dragonflies. It is most similar to the Vagrant Emperor Hemianax ephippiger since both species have a blue band at the top of the abdomen. However the Lesser Emperor is a larger insect, the blue band extends down the sides of the abdomen, the eyes are green (as opposed to brown) and the abdomen is predominantly greenish-brown (as opposed to yellow-brown in the Vagrant). Male Lesser Emperors also have a waisted abdomen.